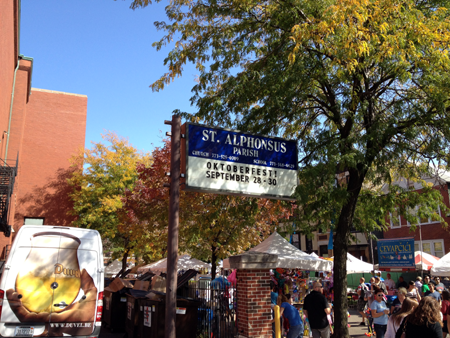 The St. Alphonsus Oktoberfest was the first stop on my Oktoberfest tour of Chicago. 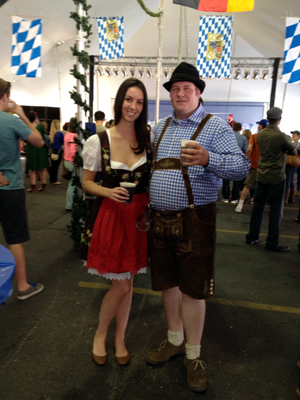 Aptly enough, this is actually called Oktoberfest Chicago. I took the Metra into the city and got off the Brown Line at Wellington and it was only a few short blocks to the church. I made a pit stop first to meet up with my buddy and his wife who were coming along with me to the fest. Admission was reasonably priced at $5 and there was an option to buy a commemorative glass Oktoberfest Chicago mug which I of course could not pass up. 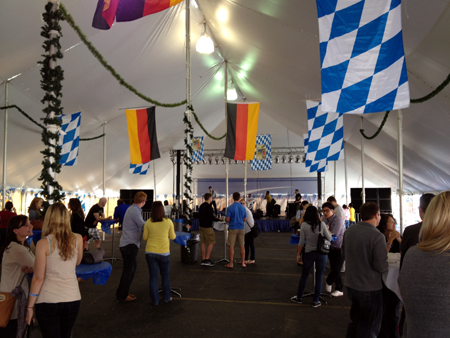 The Oktoberfest is divided amongst three parts: one being in the basement of the church, the second being under the big tent in the back parking lot and the third is the street outside the event which was blocked off and had a bunch of vendors. We spent the majority of the time under the big tent but first it was off to get beer. I surprisingly started off with a Bud Light but that was mainly because I didn’t want to get drunk too fast because today was a marathon of drinking (I went to Prost! after this then off to Zanetoberfest). That changed quickly because Bud Light is pretty much water when compared to good German beer. Speaking of, there were two German options: the first being Beck’s Oktoberfest which is alright but luckily they had Warsteiner Oktoberfest to make up for it although they ran out of it quickly. They also had a number of different food options varying from your typical carnival fare to good German favorites. Unfortunately, I did not partake in any of the food at the event but most of it smelled and looked delicious. The first band we saw was A Thousand Julys. They were a lot of fun but not German in the least but they really got the crowd started. They played a number of different hit pop songs from the past and present. I would like to see them again but not at an Oktoberfest. The next band that played was the infamous Polkaholics. They are a polka band that does not play with typical polka instruments. They perform all of their songs on the guitar and drums. They are another crowd favorite and how could you not enjoy them. They put a rock edge on your classic polka songs and their own songs will have you singing along right away…Just say yes to Oktoberfest! Regrettably, I had to depart from the St. Alphonsus Oktoberfest after The Polkaholics finished their set at 5:00p to get to Prost! and Zanetoberfest. 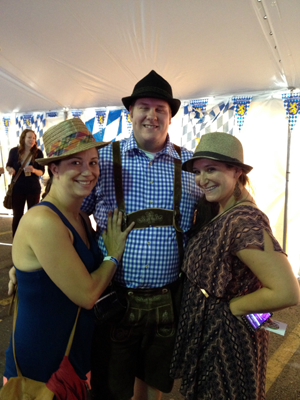 This will be an Oktoberfest I will try my best to attend next year. The crowd was a lot of fun and there were actually a number of others dressed up in lederhosen which has been pretty uncommon at other Oktoberfest celebrations I have been to this year. If you’re in Chicago, don’t miss out on this fun event.